A guilty pleasure drama about a modern-day Witch and her desire for love. It's fun, weird, and another fresh concept for the summer. 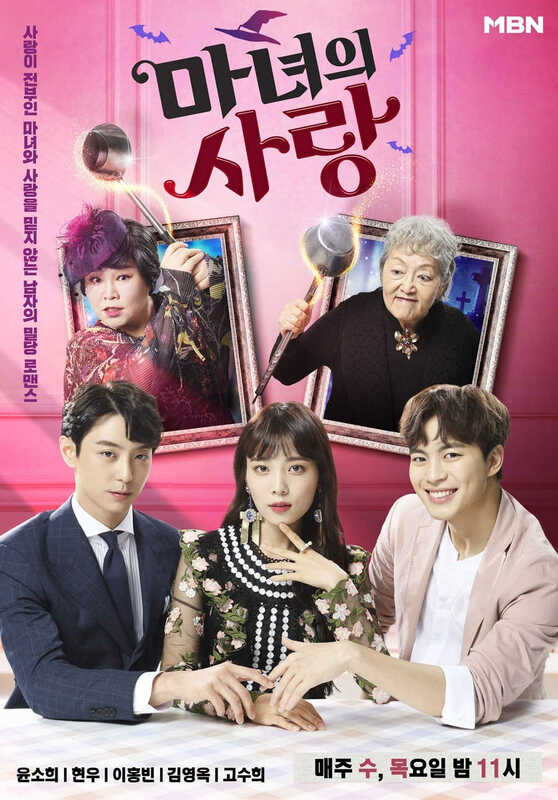 Generations of Witches have been living in Seoul, being able to entice humans in whatever they set their sights on but Kang Cho-Hong (Yoon So-Hee) grapples with financial concerns when Director Ma Sung-Tae (Hyun Woo) decides to buy the restaurant her fellow Witches have been running that is both their means of business and home. No one knows it's a secret place, the soup they serve a magical concoction while Sung-Tae has deep-rooted reasons to gain ownership of their restaurant and home, a mysterious childhood trauma linked to his past.To complicate things and establish the idea of destiny is webtoon Illustrator, Hwang Tae-Woo (Lee Hongbin) who's obsessed with the magical soup the Witches cook up and knows Cho-Hong. The reception has been fairly positive for this drama, which is rare considering how it checks off everything that makes a show cliché and although I say this, the concepts presented in it aren't all that cliché. There's a uniqueness to the drama but it still has me classifying it as minimally tawdry. I'm trying to be nice here because it does have elements to it that are pleasant and gives off a good feeling as you watch the first two episodes. I'll even go the extra mile and say this drama's premiere has done a better job than Rich Man, Poor Woman and I make the comparison because they're both MBN-Viki productions. What really helps this light rom-com is the cast since the actors have all starred in other projects, some of them gaining credibility for their roles. Both Yoon So-Hee and Hyun Woo have been in previous notable works and Hongbin as an idol-actor, has received an overall acceptance for his drama performances. In this regard, Witch's Love reminds me of Love Cells which was a light K-drama webtoon series with actors like Kim Woo-Bin and Kim Yoo-Jung. I'm not madly in love with the drama but it's obvious that the Writers aren't here to sell us a brainless romance based on over-the-top fantasy. It does a witty job of inadvertently (or quite intentionally) taking typical notions of 'rich guy meets pretty girl' tropes and flipping them on their heads. I also like the 'natural' clash of our main Witch and male lead since I don't feel like a romance or fateful encounter is being forced upon me. The magic presented here reminds me of Sabrina the Teenage Witch and I find myself enjoying how magic ties into making this show a light and fun watch, even lending itself to the overall comedy and mystery. And that being the case, it's also apparent that the show will lag at some point or plot holes will be present. It's a matter of deciding what you like, and if what you find appealing will keep you wanting more. I wouldn't keep my expectations high but this drama doesn't deserve to be thrown down the gutter either since it really isn't that bad. To be cautious, I'd wait it out for three weeks at least before making the decision to walk away or stay for good. It's simply light, fun, and gives us something new to appreciate. Personally, the actors are really likeable and pleasing to the eyes, so why not?